Mia Shulman is a lifestyle writer and acting managing editor of HGTV.ca. You can read this article on hgtv.ca here. Who: Judith Mackin, an entrepreneur, designer and studio proprietor, lives with her husband Robert Moore, a professor and poet, two Boston Terriers, Scout and Macey, and one 23-year-old cat, Roo. Judith’s adult son Robyn lives in the city. Robert’s adult daughter Jessica, her husband Mike and their son, Jack, live in Halifax. Robert’s youngest daughter, 16-year-old Alexandra, lives in Fredericton and visits on weekends and holidays. Click to see a full home tour of Judith’s contemporary oasis. “Into the Wild,” a term coined by our architects (ACRE Architects) is an über-modern residential project on 2.3 acres of partially forested, hitherto undeveloped land in the heart of historic Saint John, NB (Canada’s oldest incorporated city, located on the Bay of Fundy). It’s a 2400 sq ft, green-roofed, two storey home (plus a “zero level” which houses the design and decor studio, TUCK). The house has two and a half baths, three bedrooms (the bedroom on the first floor is currently being used as Judith’s office). There’s a large walk-out deck off the second floor flex space. Construction finished in August of 2012. The home–the most modern home in this historic city–is an open concept design, with large windows (to enhance passive solar). We recently downsized from a 4000 sq ft heritage home in the neighbourhood. How did you come to live in this home? In our time together, we’ve renovated and flipped two historic homes. We finally came to the realization that we were “moderns” at heart, and decided to build from scratch. Our realtorintroduced us to this vacant piece of land one rainy spring afternoon a couple of years ago. We couldn’t believe such a dramatic and promising piece of land had been vacant for the last half century. How did you proceed from an empty lot to the home you now live in? You own and run your own interior design company, Punch Inside. Describe how your background influenced the evolution of your home’s design. Happily, Robert and I share the same modern aesthetic. We both are drawn to clean lines and minimalism. It’s not everyday you find someone content to live with a steel staircase in the middle of their home. So far as the process of designing the home with our architects is concerned, we quickly discovered that we were highly compatible in terms of design. 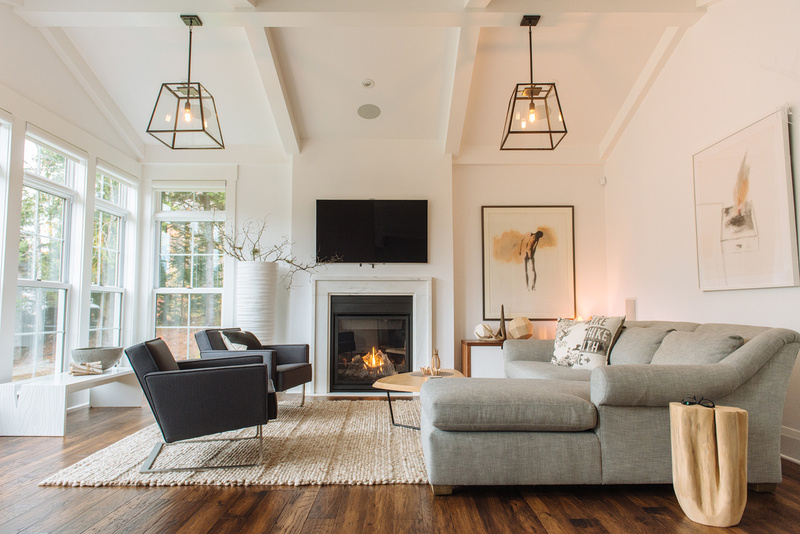 We trusted their taste, and knew they’d take our rough notions of how our house should look and function, and turn them into something we’d be proud to live with, and inside. For me professionally, I learned so much from Stephen and Monica. How would you describe your style? What are your design style preferences? Who do you follow in terms of other designers/architects? The home’s design lends itself beautifully to these interests. It’s been an incredible privilege and adventure filling these rooms with work by my favourite designers and visual artists. That love of industrial design has informed more than just the living space, I gather. You recently opened up a business devoted to it. Talk to me about TUCK STUDIO. Opening Tuck Studio had been on my radar for several years, but, it was about finding the perfectlocation. Once we looked at the land and the modern build, it became clear to us early on in the design process that TUCK would be housed on level zero. The house is built on the cliffside and there are large floor to ceiling windows at the front of the studio so it feels open and airy like it’s on level ground. I originally had planned to have the studio exclusively for my interior design clients for them to come and experience the furnishings and décor I was recommending for their residential and commercial spaces, but as I started to curate our offerings, I felt that it was a shame to limit it to existing customers only. Tuck Studio has regular studio hours now and is open to everyone who is interested in design. Our studio features the very best in emerging and established design for the home and office. Our focus is on Canadian and Scandinavian Design but we of course have many American designers as well aswork from Iceland and Japan. Gus*Modern is our number one furniture collaborator. We also show artwork by established visual artists including Gordon Jennings, Suzanne Hill, Chris Lloyd, Alexandra Flood, Janice Wright Cheney, Deanna Musgrave and Herménégilde Chiasson. We opened on September 1st and the response and support from the community has been nothing short of astonishing. 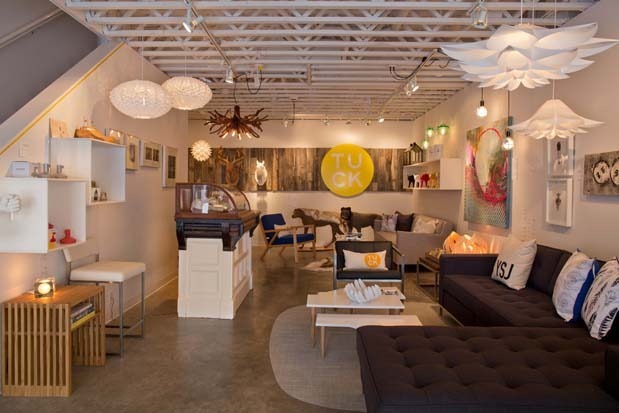 Are the decorations and furnishings in your home all from TUCK STUDIO? Robert and I have a saying (I hope the tax man is listening): “We live what we sell.” Almost everyone who visits the studio downstairs is offered a complete house tour. We love sharing the experience of the home–which is quite dramatic–and use the opportunity to point out furniture and decor not currently on display in the studio, but available through it. I’d say roughly 75 per cent of our current furniture and decor is from the studio, and it’s in constant rotation (especially when photographers come to call). Favourite room in the house? Why? This depends on the season. When it’s nice outside, we love the green roof on the second floor. It offers a wonderful view of the city. In the winter, we’re drawn to the main floor living space, probably because of the gas fireplace and easy access to the wine cupboard. Saint John isn’t known as a hotbed of modernism or progressive design. How has your community embraced this modern build in one of its most historic neighbourhoods? I think the community was a bit nervous at the beginning. For example, no one could believe that our Wyoming snow fence siding was an informed choice (including the appraiser for the bank, who wondered what we were going to cover it with), and I can’t tell you how many people offered their sympathies for our prematurely rusting garage. But generally, people have been very supportive, proud that their city can do both historic and modern.